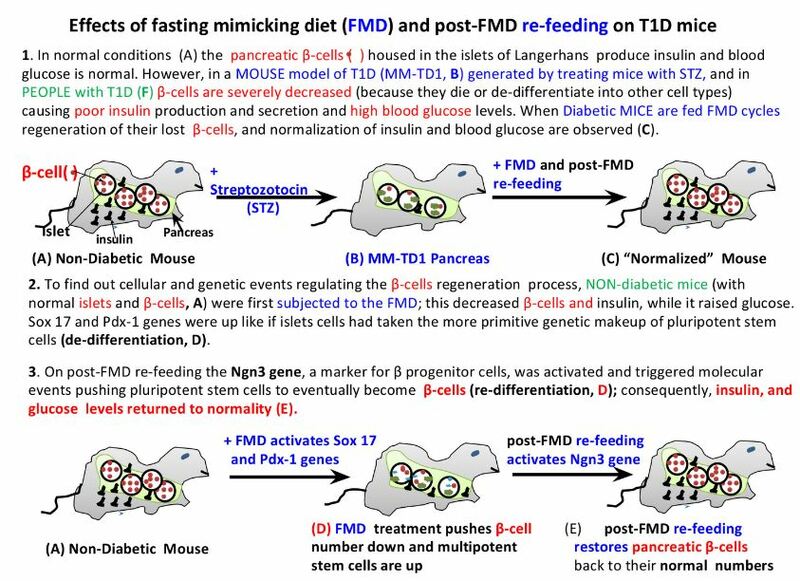 New research by a group of scientists at the University of Southern California led by Dr. Valter Longo tested a fasting mimicking diet (FMD) for its ability to promote β cell regeneration in both T1D and T2D mouse models, and in pancreatic cells from people with and without Type 1 Diabetes (Cheng et al., 2017; Reference 1). The FMD is low in calories, proteins, and carbohydrates, but high in unsaturated fat. With respect to T1D, Dr. Longo and collaborators started out by studying an animal model of T1D consisting of mice whose β-cells were ~85% depleted with high dosed of streptozotocin (STZ). These mice reached a glucose level of >300mg/dL within 5 days of SZT treatment. At which point, they were subjected to multiple cycles of FMD. Each cycle (lasting 7 days) consisted of a 4-day FMD followed by a 3-day post-FMD re-feeding. Insulin and blood glucose were almost in the normal range at day-50 of treatment, while untreated animals had glucose levels around 450 mg/dL. When they analyzed the pancreatic islets they observed that glucose normalization had resulted from the nearly complete restoration of insulin producing β cells. Moreover, T1D is a disease burdened by inflammation; these investigators found that FMD cycles reduced inflammation as indicated by the changes of levels of cytokines (Footnote iii) in the treated animals. Having observed the restoration of pancreatic β cells upon the FMD and the post-FMD re-feeding treatment, these scientists wanted to understand, in more detail, how the restoration process occurred and the genes and proteins regulating it. In order to do this, they studied the effect of 4-day FMD and 3-day post-FMD re-feeding on pancreatic islets, in particular on β cells of normal (non-diabetic) mice; they took pancreatic and peripheral blood samples from these animals at various times prior and during FMD cycles treatment. They observed that 4 days of FMD resulted in the decrease of these animals’ pancreatic islets and in particular in a 35% decrease of β cells; yet, upon 3 days of re-feeding the number of insulin producing β cells had returned to normal levels. They also observed that insulin and blood glucose had dropped by ~70% after the FMD treatment, but reverted to normality within 24-36 hr of re-feeding. With respect to gene regulation they found that, towards the end of the 4-day FMD, a gradual increase in the expression of Sox 17 and Pdx-1 genes had occurred; these genes are early markers of the pancreatic cell lineage during embryonic development. It looks as if the FMD treatment de-differentiated (footnote iv) pancreatic cells, such as β cells, to take the more primitive genetic makeup of pluripotent stem cells (footnote iv). Moreover, during the early phase of post-FMD re-feeding the Ngn3 gene, a marker for β progenitor cells, increased. In other words, post-FMD re-feeding pushed the pluripotent stem cells to re-differentiate (footnote iv) into progenitor pancreatic cells that finally matured into insulin producing β cells. Human islets from T1D people. They also wanted to investigate whether the FMD would affect gene expression of human pancreatic β cells. To do this, they took pancreatic β cells from non-T1D and T1D people and added to them sera from healthy people enrolled in a clinical trial that is testing the effect of the FMD on ageing and diseases related to ageing. They used plasma samples prior to FMD (baseline) and after 5 days of FMD. Then they investigated the expression of the lineage-reprogramming markers which they had found reprogrammed in mice. They observed that fast mimicking conditions induced the expression of Sox2, Ngn3, and insulin in both healthy and T1D islets. Further investigations revealed even more molecular players; specifically, it looked like “the reduction of IGF-1 levels and the consequent downregulation of PKA and mTOR activity” (footnote v) were key events in the expression of the essential lineage markers Sox2 and Ngn3 leading to the regeneration of human islets and β cells. With respect to T2D they used mice with a point mutation (footnote vi) in the leptin receptor gene (db/db mice) which causes insulin resistance in the earlier stages of diabetes and failure of β cells function in the later stages of the disease. At 10 weeks of age (which they referred to as the baseline) these mice developed hyperglycemia which triggered the pancreas to produce and release more insulin in the blood because their bodies attempted to normalize blood glucose concentration. Then, after another two weeks, insulin declined and the mice developed severe hyperglycemia. These scientists wanted to reverse T2D in these 12-week old animals with weekly cycles of the 4-day FMD followed by 3-day post-FMD re-feeding. They showed that pancreatic islets taken from db/db mice treated with cycles of FMD up to 120 days had restored glucose-stimulated insulin secretion, increased insulin sensitivity, and almost normalized their blood glucose, and improved survival. As they stated: they “have rescued mice from late stage T2D”; on the other hand, untreated animals were still T2D. These studies are very interesting but are still at the stage of mouse models of T1D and T2D; and they have only shown that islets from pancreas of T1D people can be brought back to produce insulin. Moreover, T1D is an autoimmune disease therefore the immune system may still kill or render not functional the β cells that are regenerated. Will the FMD cycles be able to continuously replace the β cells that are killed or rendered dysfunctional, and for how long? 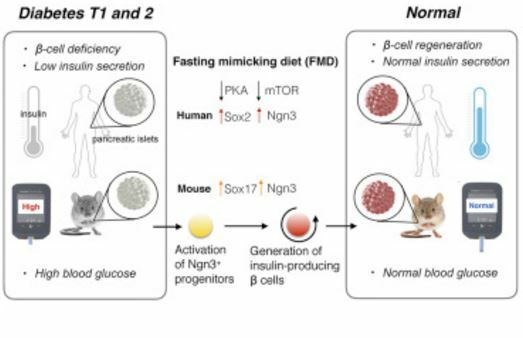 We are anxiously waiting the fasting mimicking diet to enter clinical trials to verify whether β-cells in T1D’s and T2D’s regenerate and normalize their blood glucose levels naturally. Hopefully, clinical trials specifically for diabetes are not far away as Dr. Longo and collaborators have recently published a paper on February 15, 2017 in Science Translational Medicine (Wei et al 2017, Reference 7) reporting a Phase II clinical trial in which 100 healthy people were randomized to be treated with three rounds of either FMD (71 people), or normal food to see if markers predictive of certain diseases could be ameliorated. After analysis of the participants they concluded that as a result of 3 cycles of the FMD “body mass index, blood pressure, fasting glucose, IGF-1, triglycerides, total and low-density lipoprotein cholesterol, and C-reactive protein were more beneficially affected in participants at risk for disease than in subjects who were not at risk.” These positive results and those in the work of (Cheng et al., 2017, Reference 1) should present a good case for starting clinical trials specific for diabetes. With respect to T2D and dieting a recent study led by Dr. Roy Taylor at the Newcastle University (U.K.) included 30 participants with T2D duration from 0.5 to 23 years (Steven et al, 2016, Reference 8). These people were subjected to a specially designed very low-calorie diet (VLCD) for 8 weeks, followed by a two week diet still containing the same amount of calories (isocaloric) but composed of normal food. Then they were given a specific personalized diet for weight maintenance over 6 months. The initial weight of the participants was (98.0 ± 2.6kg) and, upon dieting decreased to 83.8 ± 2.4kg; it remained essentially stable over 6 months. 12/30 participants were able to achieve a fasting glucose of <7 mmol/L without taking antidiabetic drugs. They concluded: “a robust and sustainable weight loss program achieved continuing remission of diabetes for at least 6 months in the 40% who responded to a VLCD”. Moreover they reported that “a community-based study (DiRECT [Diabetes Remission Clinical Trial]) is now under way in 280 people with T2DM randomized to VLCD” to expand and possibly validate their studies. It is important to point out that they have achieved remission and at this point it is not a cure! i. Insulin resistance occurs when insulin loses its ability to effectively foster glucose uptake by cells such as fat and muscle cells. ii. The islets of the Langheran are small (about 0.2 mm diameter) clusters of cells disseminated across the pancreas constituting 1-2% of its mass. They contain glycemic regulatory hormones producing cell species such as: (I) β-cells that produce insulin (each islet contains approximately 1,000 β-cells, i.e., they constitute the majority of the cells of the islet); and (II) α-cells that produce glucagon that raises the glucose concentration in the blood, thus opposing the insulin glucose-lowering activity; also present are the three cell types, -, ε-, and PP-cells, each one of them secretes specific hormones. iii. Cytokines are small proteins that cells produce and release to interact and communicate with other cells. They are also involved in inflammation; there are pro-inflammatory cytokines and anti-inflammatory cytokines. iv. Pluripotent stem cells (e.g, embryonic stem cells) are cells that can become any type of cell in the body (there’s around 200 different cell types in the body). Cellular differentiation is a process whereby cells change from one cell type to another. Embryonic stem cells becoming any other cells are examples of cell differentiation. Cellular de-differentiation is a process whereby a partially or terminally differentiated cell reverts to an earlier developmental stage. More details in https://en.wikipedia.org/wiki/Cellular_differentiation. The de-differentiated cells can return to their original specialized form by a process called cellular re-differentiation. For example, we can take skin cells and by the addition of certain factors in Petri dishes reprogram (de-differentiate) them to an embryonic-like state or “induced-pluripotent” stem cells (iPSCs). Then, by adding specific factors we can convert (re-differentiate) the iPSCs back into skin cells or into many other cell types (depending on the factors we add). v. IGF-1 (Insulin Like Growth Factor 1) is a protein similar to insulin, but whose principal role is to mediate cell division, growth, and development; PKA (Protein kinase A) has important functions in the cells, which include regulation of glycogen, sugar, and lipid metabolism; mTOR (mechanistic target of rapamycin) is a protein that is involved in the regulation of cell growth, cell proliferation, cell motility, cell survival, and protein synthesis. vi. Point mutation is a change in a single base of a piece of DNA; here the change is in the gene encoding for the protein leptin receptor. As a consequence the protein has an amino acid change that makes it dysfunctional and leads to T2D in these mice. Wei M, Brandhorst S, Shelehchi M, Mirzaei H, Cheng CW, Budniak J, Groshen S, Mack WJ, Guen E, Di Biase S, Cohen P, Morgan TE, Dorff T, Hong K, Michalsen A, Laviano A, Longo VD. Fasting-mimicking diet and markers/risk factors for aging, diabetes, cancer, and cardiovascular disease. Sci Transl Med. 2017 Feb 15;9(377). pii: eaai8700. doi: 10.1126/scitranslmed.aai8700 . Steven S, Hollingsworth KG, Al-Mrabeh A, Avery L, Aribisala B, Caslake M, Taylor R. Very low calorie diet and 6 months of weight stability in Type 2 diabetes: Pathophysiologic changes in responders and non-responders. Diabetes Care, March 2016 DOI: 10.2337/dc15-9422 http://care.diabetesjournals.org/content/early/2016/02/24/dc15-1942. For stem cells, part 4 of: http://www.steelimmunity.com/blog/2015/12/28/type-1-diabetes-research-advances-to-develop-a-cure . Dec 29 2015 Type 1 Diabetes: Research Advances to develop a cure. 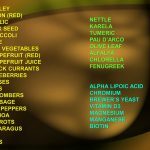 For stomach cells: http://www.steelimmunity.com/blog/2016/3/9/vw7azdrf5at25wpv5fqt9opeksl7xc . Mar 9, 2016 Stomach tissues reprogrammed to produce Beta-cells restore normal glucose levels in type 1 diabetic mice. 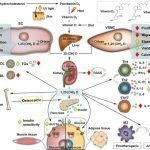 For skin cells: http://www.steelimmunity.com/blog/2016/5/24/2016-another-step-forward-in-the-quest-to-cure-type-1-diabetes-scientists-coax-skin-cells-from-type-1-diabetes-patients-to-become-insulin-producing-cells . May 24, 2016 Another step forward in the quest to cure Type 1 Diabetes: Scientists coax skin cells from Type 1 Diabetes patients to become insulin producing cells.